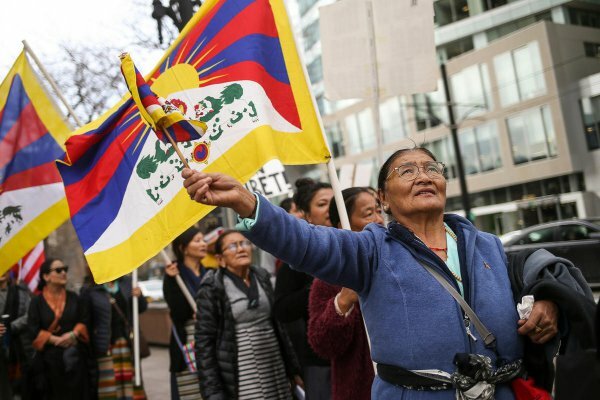 Every 10th March, on the anniversary of the 1959 Tibetan uprising against Chinese occupation, supporters around the world commemorate the date with protests against human rights violations in Tibet. This year, as dozens of demonstrators rallied on the steps of the State Capitol, members of the Utah Tibetan Association took the opportunity to thank for the support they received worldwide. Below is an article published by Deseret News. Dozens of demonstrators rallied on the steps of the state Capitol Friday, marching and singing Tibetan hymns, and commemorating the anniversary of the 1959 Tibetan uprising against Chinese occupation. On March 10, 1959, thousands of protesters gathered in the streets of Lhasa, the capital of Tibet. They protested what they believed was an attempt by the occupying Chinese government to kidnap their spiritual leader, the Dalai Lama. The protests in Tibet allowed the Dalai Lama to escape from the country. While he and many Tibetan leaders fled to India, the country remained under Chinese control. Proponents of the Tibetan independence movement throughout the world celebrated the 58th anniversary of this demonstration by sending their statements of appreciation to the countries that have taken them in. The members of the Utah Tibetan Association took to the Capitol on Friday and read statements of thanks for the hospitality and support that they have felt within the United States. Some marchers also held signs calling for Tibet to open to news media access. "Every March 10 we protest, but nowadays we are focusing more on human rights in Tibet and freedom in Tibet," said Tenzin Dechen. "They rarely get freedom, so they are under really strict rules." Dechen said people in Tibet are not even allowed to have pictures of the Dalai Lama. She said that her movement focused on a "middle way" approach, calling for increased human rights for Tibetans, rather than a total effort for full independence from China. The first step for human rights reform in Tibet, she said, would be to allow free speech and discussions of religion, starting with an open dialogue between the Dalai Lama and the Chinese government. Chuck Tripp, a former professor of political science at Westminster College, also spoke at the rally. "Buddhism is spreading in China and this is a good thing, maybe it will bring about some real changes there," Tripp said. Proponents of the movement cheered the Dalai Lama's name and touted his continued meetings with world leaders and friendly nations.